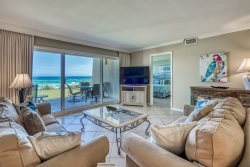 This 3rd floor condo is an end unit with gorgeous views of the gulf. It is a 1 open bedroom plus bunks with 1 bath. Perfect for a family, ! You can enjoy a cup of coffee or a glass of wine of the balcony overlooking the Gulf of Mexico. The location is fabulous with all the shops and restaurants within walking distance. Beach access is across the street and you can enjoy any of the 3 pools and hot tub that are available within Gulf Place. Master Bedroom with Queen Bed, Queen sleeper sofa, and bunk beds. Add $100 for housekeeping and 11% for tax. $69 damage protection; $30 booking fee, 2.5% to process credit card payments. 25% of the total is due at booking and will hold the unit for you. The remaining balance is due 30 days prior to your arrival.